An ancient sea creature that lived on Earth about 520 million years ago had bizarre facial appendages that it used to filter food from the ocean. 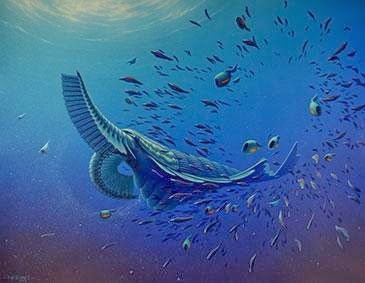 Known as Tamisiocaris, the marine animals lived during a period known as the “Cambrian Explosion,” when major animal groups suddenly appeared. The new findings, published in Nature, cite evidence that the animals evolved into filter feeders that transformed their grasping appendages into filters that could trap organisms in the water like a net. "Tamisiocaris would have been a sweep net feeder, collecting particles in the fine mesh formed when it curled its appendage up against its mouth," Martin Stein of the University of Copenhagen said in a statement. "This is a rare instance when you can actually say something concrete about the feeding ecology of these types of ancient creatures with some confidence."